Welcome to Bujinkan Taka-Seigi Dojo | San Diego, CA (BTSDsd). This dojo is sponsored and sanctioned by Shihan (Master Teacher) Phil Legare and we train in alignment with his philosophy and under his guidance. His website can be found at www.TakaSeigi.com. The Taka-Seigi Dojo was started in 1987 by appointment of Hatsumi Soke, the Grandmaster of the nine schools of the Bujinkan, to transmit Soke's martial arts directly to America. The philosophy of the Taka-Seigi Dojo is to help individuals, families, communities, and countries come together in Budo spirit to meet their needs and counter the threats of today by combining historical martial arts and practical combat applications. 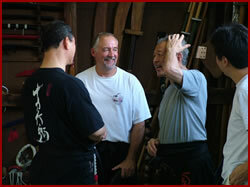 Taka-Seigi Dojo | San Diego, CA was started in 2005 by Bill and Laura and was brought into the BTSD family in 2009. We are honored and grateful for the mentorship of Shihan Phil Legare and work to provide the best program of training. We are certified by the home dojo in Japan are the premere training facility for Bujinkan in San Diego. No other dojo can match our beautiful 7000+ sq ft facility, our mentors, staff, or our students! BTSDsd is first and foremost a place of training. It is not a club or a social gathering or a place for adolescent boys to gather to pretend they're training to be a ninja. BTSDsd is a place where people come with a purpose and work with others that share similar concerns. We train with a serious mind and the intensity needed to live life. We do this without losing sight of our humanness or sense of humor. The primary purpose of our training is to deal with a concern that we all share, self-defense. We offer another definition: the physical defense of ourselves and those important to us against a determined attacker. This definition enables us to train ourselves more effectively and is the center of gravity for everything we do. All else, while important and enjoyable, is secondary. Our approach to training is rigorous enough for professional warriors (i.e. law enforcement and military) and structured enough for the common person. We offer free trial classes, both so potential students can evaluate us and we can evaluate them to ensure a good fit. Prior training in martial arts is not required. Physical prowess is not required. Complete dedication is not required or even considered healthy. The study of Budo and Bushido is part of our lives, it isn't our life. Rigid discipline and unexamined ritual is not part of what we do. Many schools claim that their art is taught to the special operations community. They do this by riding on the reputation and success of others. We actually have members of the special operations community training with us. That is the level and quality of training we provide. That they have brought their family in to train with us is another testament to our training hall. Our dojo is built for working professionals, real people with real lives. Involvement of the whole family is welcome and encouraged. All people of good character are welcome to join us. Please contact us for a free trial class when you are interested in training. Contact us at (858) 226-6985 or info@BTSDsd.com. The Mondaine watches have gained gigantic popularity ever since they came into being. The fans of the Mondaine wrist replica watches sale are all over the world. The replica watches sale brand has become associated with fashion and timelessness in one graceful design which makes. This is basically one of the earliest replica watches sale companies and also one of the most widely renowned ones. All over the world, they have managed to build a strong customer base that is ever looking for their breitling replica sale and modern designs. This watch company holds the pride and honor of having their wrist rolex replica sale displayed in the Museum of Modern Art in New York. Their replica watches uk models have broken previous sales records and have seen a boom in the demand of their watches.